I spent two hours organizing photos and the only thing that kept me from getting stabby was Clara. Seriously. 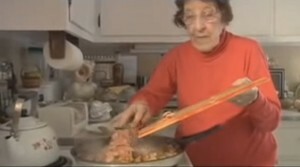 I’m not sure exactly how I found her – but the first video I watched was featuring her Depression era ‘Poor Man’s meal’. At 1,204,724 views I can see why her show is still so very popular. Not just for her recipes, mind you, but for her stories. My husband and I lamented not getting our elders on camera to share the same. . . so for a few hours, while I worked on some photographs, I listened to Clara and cried a little along the way. Why? Well, my father was born in 1921 and some of the dishes Clara shares are familiar to me. 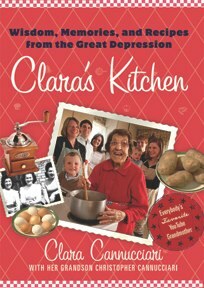 I grew up eating some of the depression era staples that were comfort food for my father – so discovering Clara was such a gift and trip down memory lane. I loved hearing about her garden and how her family grew some of their own food. Thanks to Clara, I’m thinking that even my potager garden will get a little more attention this year. I hope that you enjoy meeting Clara and most importantly enjoy making this dish along with her. I know will be trying a few more of her recipes sooo if you see me in your yard with a knife, don’t worry, I’m only there for the dandelions. If you love to cook – I highly recommend subscribing to her channel. Though she is gone now, her stories and depression era recipes live on. Her grandson Chris Cannucciari, who happens to be a filmmaker, has made sure of it. I can’t thank you enough Chris. Clara shares a simple recipe known as the poor man's meal. This is my interpretation of her recipe for 2 separate meals for 2 people.